Brief Description: Chemi-pure removes dissolved organic waste, food and other particulates quickly and safely by filtering them directly from marine and freshwater tank water, stopping the bacteria build up. Notify me when "Boyd Chemi-Pure Grande [40 oz]" is re-stocked. Chemipure quickly filters excess waste nutrients that bacteria feed on, stopping bacteria build up and clearing your tank. Most fish tanks and aquariums become cloudy, dirty or murky as bacteria consume waste and multiply, clouding up the water. 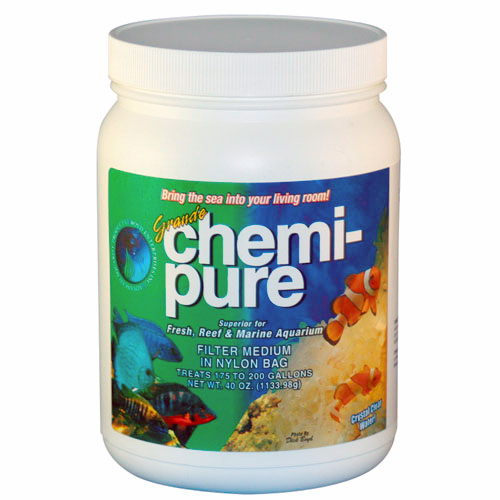 Chemipure removes dissolved organic waste, food and other particulates quickly and safely by filtering them directly from marine and freshwater tank water, stopping the bacteria build up. Chemipure is a simple-to-use filter media suitable for all types of aquatic environments, and which is manufactured with the latest technologies available. Chemipure is very economical, and provides problem-free filter operation. Chemipure is a nylon filter bag filled with a high grade blend of activated carbons and ion exchange resins. The activated carbons filter particulates and waste while the ion exchange resins help remove nitrogen (ammonia and nitrate) build up which is harmful to your fish. Chemipure also stabilizes water chemistry while keeping your pH levels perfectly constant. Its effects are far reaching, another reason why aquarists worldwide have been using it for years to help improve the life and health of their aquariums.